Fortunately, my verdict is that Armand Coeck's music is very listenable, and that it has been attractively presented here by the three performers and by the engineers. Coeck (b. 1941) is a Belgian guitarist and composer, who, according to the booklet notes, is self-taught. He has been composing since he was a teenager, and in 1961 and 1962 he "shared the spotlight with Joaquin Rodrigo and Sainz de la Maza in the prestigious Coupe Internationale de la Guitare composition competition." In its reliance on melody and conventional tonality, his music is about as conservative as new classical music gets. Nevertheless, it isn't "dumbed down" in any way. Coeck uses no tricks or gimmicks, and jumps on no stylistic bandwagons in these pieces. Honest and direct, his music is what it is. Many of the pieces were inspired by nature, and have a touch of the fantastic as well. Green Valley, Madreselva, and the title piece are for unaccompanied cello. The cellist is joined by one guitarist (Joris D'Haene) in the rest of the pieces, except in Ballade and Rosa Mystica, where he also is joined by a second guitarist (Gino Herman). The combination of cello and guitar(s) is not a common one. Still, Coeck's music makes it seem utterly natural, even inevitable. It turns out that all eight of these pieces were composed, between 1997 and 2005, for Vercruysse. 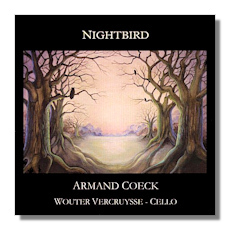 Previously, Coeck had not composed for the cello at all, so the music's idiomatic quality is particularly impressive. Like Coeck, Vercruysse (who was born in 1981) is Belgian. His curriculum vitae is varied (including studies with Yo-Yo Ma, and work with the Silk Road Ensemble), but has career has been based largely in Belgium. He credits Coeck as his personal mentor, and the deep bond between Coeck and Vercruysse is made apparent by the eloquence of Vercruysse's very accomplished playing. Vercruysse plays a French cello from the 1800s, and he seems incapable of drawing an ugly or uncommunicative sound from it. Guitarist D'Haene is even younger than Vercruysse – he was born in 1987. That means that he was still a teenager when this CD was recorded, but there's no trace of immaturity in his polished musicianship. In Ballade and Rosa Mystica, Herman makes a similarly favorable impression. It turns out that both D'Haene and Herman also studied with Coeck. The striking cover art is by Coeck as well – a watercolor titled Enchanted Woods. In other words, many of the elements that make up this CD are interrelated, and that creates a feeling of warmth and coziness – like-minded creators coming together. I'd say that this is a fine CD for late-night listening.